Twilight sitting on Jim's porch, where he was found. Photograph by Suzanne Shoemaker. Its baby season for great horned owls and that means its baby season for Owl Moon too! In the past three weeks I’ve have had four baby great horned owls come through my doors. I know I said last time this was going to be a two part story, but there so much to tell it looks like it’s going to be three parts. The first baby great horned of the season was a “brancher” from Rockville, MD. A brancher is a baby who has graduated from the nest but is not yet able to fly. In this stage they climb around in the tree branches (hence called “branchers”), building their strength. Branchers often wind up on the ground, and their parents will continue to feed and care for them. Jim discovered the owlet when he arrived home from work on April 3rd. He stepped up onto his deck, and right there in front of him was a baby Great Horned Owl, perched on the railing by his back door. Jim knew what it was because he and his family had been observing them since February, when the pair built their nest. Jim left the baby undisturbed that evening, but discovered the bird was still there the next morning as he was getting his kids ready for school. 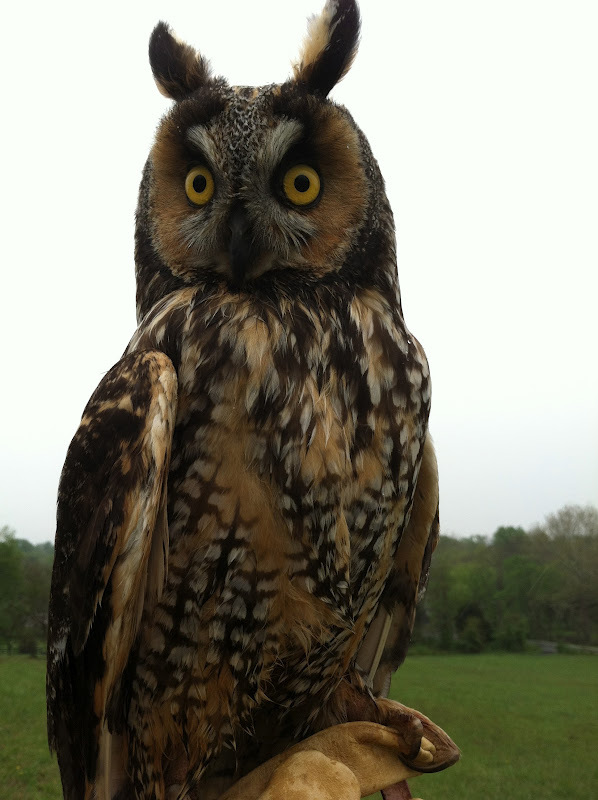 Jim was concerned for the owl’s safety, so he contacted Second Chance Wildlife Center, who referred him to me. When I arrived, I first examined the baby owl to make sure it wasn’t injured. Jim’s son named the baby owl “Twilight,” after an owl character from the book series Guardians of Ga’Hoole by Kathryn Lasky. Twilight appeared healthy, so my next objective was to scope out his nest to see if he could be returned to it. Though their parents will tend to them on the ground, in suburbia it is best if you can get branchers back into the nest tree if possible, where they are safe from prowling pets and traffic. 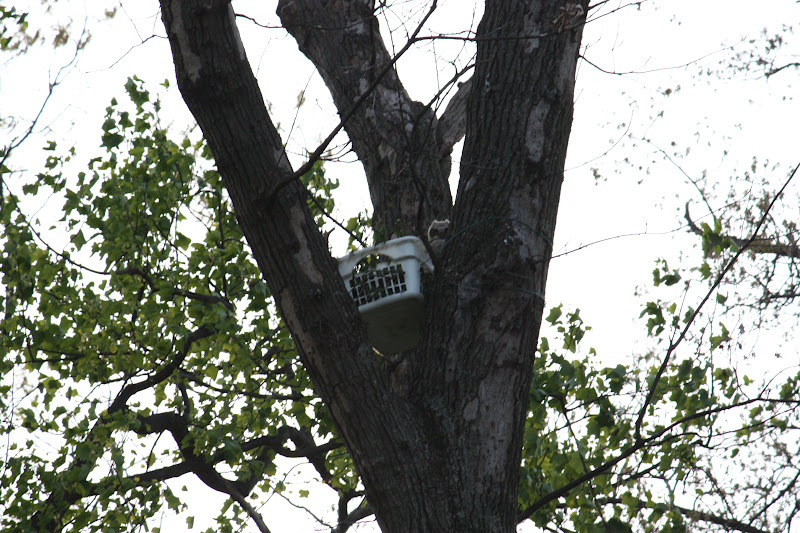 The nest was intact; 80 feet high in a white oak tree, across the ninth green of the Manor Country Club Golf Course in a grove of trees a good distance behind Jim’s house. However, there were two complications. Firstly, the tree was dead. It was not safe to climb to the height of the nest. Second, there was another baby still in the nest. This was problematic because at the branching age siblings can be spooked out of the nest when a climber approaches to put the other baby back. For the safety of the climber and Twilight’s sibling, we decided to build a replacement nest rather then put Twilight back in the original. 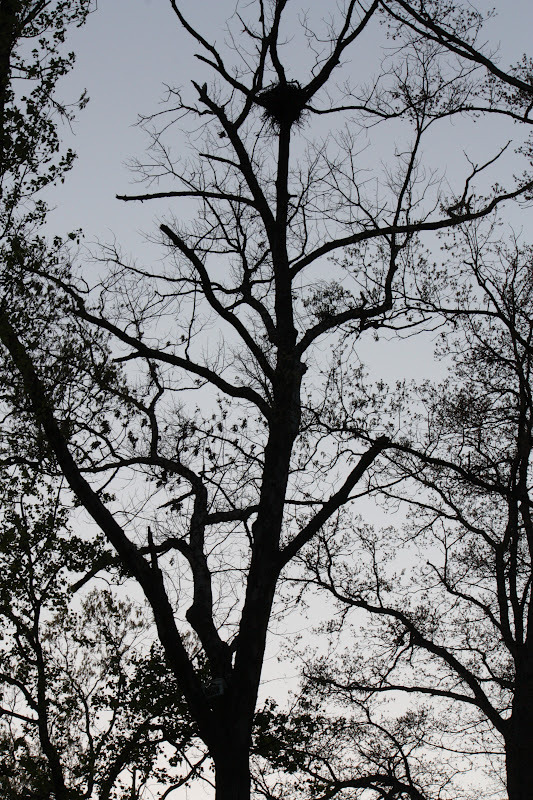 The original nest is visible 80 feet high in a dead oak tree. Photograph by Suzanne Shoemaker. I built a new nest in a laundry basket with the help of Jim’s son, his wife Georgeann, and my friend Lee (also a wildlife rehabber). Owl Moon’s “re-nesting” partners, Mike Fried and Jason Beach of Comprehensive Tree Care, were prepared to take on the job. Our standard re-nesting procedure goes like this. First, we consult with the climbers to scout the best accessible location for the new nest. Preferably we choose a place in the same tree as the original nest, but a neighboring tree can suffice for older babies. 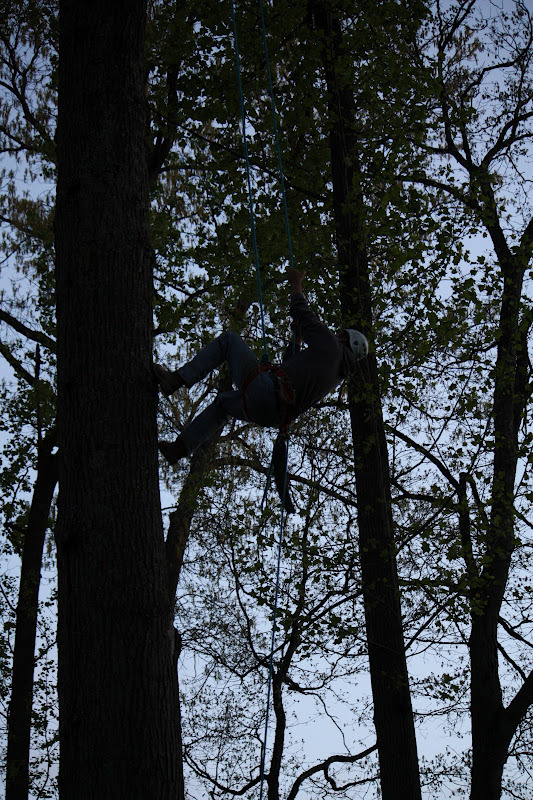 Then, Mike sets up the ropes and Jason climbs to the new nest site. 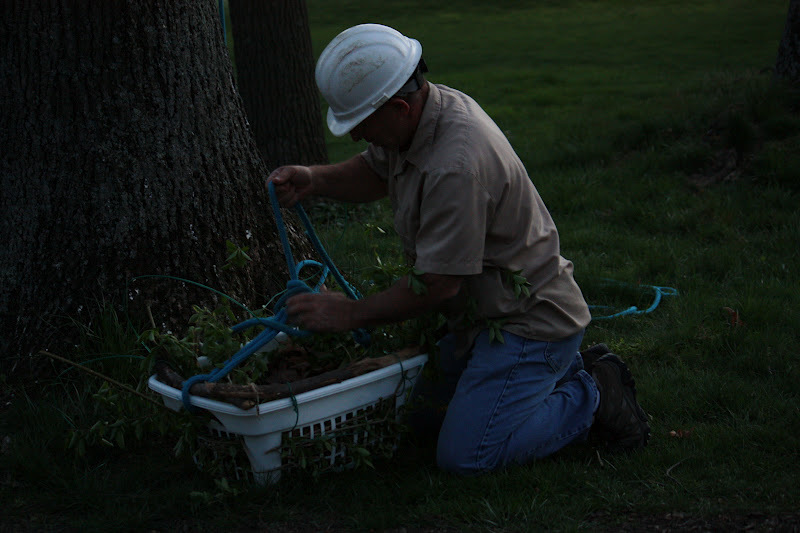 We tie the nest basket to the ropes, along with tools to mount it to the tree, and send it up. With the nest mounted, Jason sends the rope down for the baby. We place the baby in a soft cooler or 5-gallon bucket covered with a towel, tie this to the rope, and send it up to Jason. Jason carefully removes the baby and places it in the nest, from below the nest if possible. Out of sight, he waits quietly to make sure the baby settles in before descending to the ground. Mike prepares the laundry basket nest for its ascent into the tree. Photograph by Suzanne Shoemaker. Jason climbs into the tree. Photograph by Suzanne Shoemaker. Jason raises the laundry basket nest into the tree. Photograph by Suzanne Shoemaker. The whole procedure went off without a hitch. 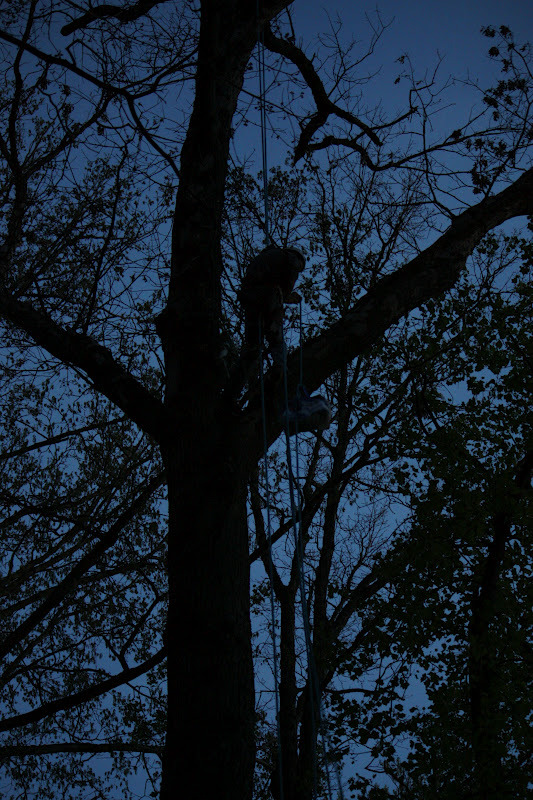 We left that evening with Twilight safely back in his nest tree, sixty feet up in a cozy basket. His sibling was twenty feet above him in the original nest. One of the parents, who had been watching us from a distance as we worked, flew in to join the sibling in the original nest just as we were packing up to leave after dark. One of Twilight's parents looks on as we work. The adults watch out for their babies even after they leave the nest. Photograph by Suzanne Shoemaker. 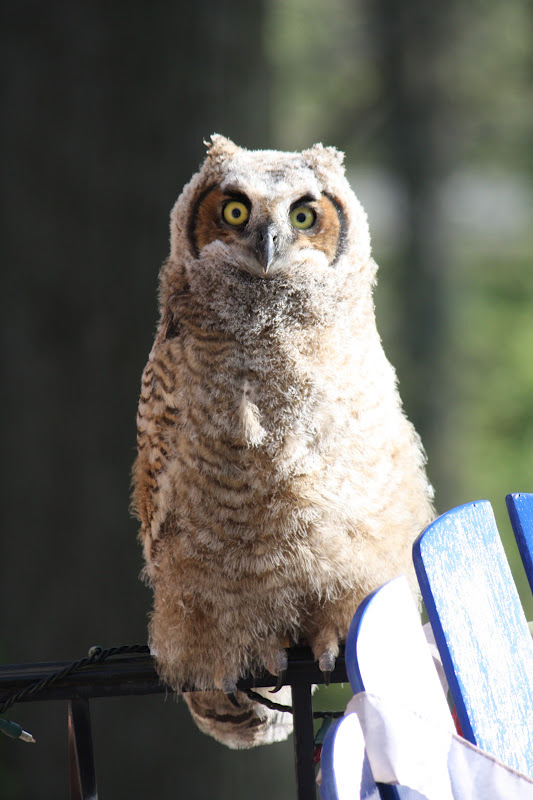 The whole thing had gone perfectly, so I was surprised when I received a call the next morning from Randy, Head of Greens at Manor Country Club, telling me there was a baby owl on the ground at the golf course. When we arrived, we discovered that is was not Twilight this time, but his sibling who had come down. Twilight was still where we left him, perched on the side of the nest basket. Twilight peers down the from his new nest. Photograph by Suzanne Shoemaker. Both owlets coming down in such quick succession without any foul weather involved was an indication that maybe they were near enough to being fully fledged to be on the ground. As mentioned above, in the normal course of an owls’ maturation, and with great horned owls in particular, the babies often spend time on the ground between branching and being fully flighted. Their feathers provide camouflage, and their parents will lead them to cover, feed them, and defend them against predators. My concern was that their home was a golf course, with very little cover, no limbs low on the trees, and lots of golfers. We decided to try putting Twilight’s sibling, which Jim’s son named “Gylfie” after another owl character in the series, into the nest basket with Twilight. It was risky because we would be disturbing Twilight, who had settled in nicely, but it seemed worth the risk to get Gylfie up out of harms’ way. The plan was set for the next morning. Lee and I arrived early to give Gylfie some food and fluids prior to re-nesting since it would be evening before her parents would feed her. Jason and another Mike, Mike Rice, arrived and set up the ropes, just as they had done two nights before. The problems began at the critical moment when Jason went to put Gylfie in with Twilight. Unfortunately, Twilight had settled on the basket perch closest to where Jason was forced (by the way the tree was configured) to approach. He would need to get past Twilight to get Gylfie into the basket. 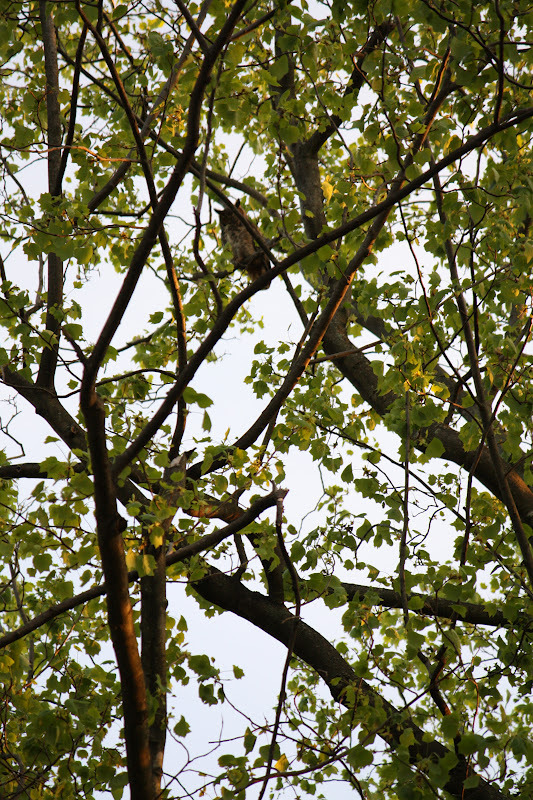 Jason’s approach was slow and careful, but the disturbance was too much, and both owlets flew from the nest. The key word here is “flew.” These two youngsters were so close to being fully fledged, that they managed to fly a good distance before landing on the ground. Granted, theirs were not the smoothest of landings, with one rolling head over heels, but both were fine. We decided to try again. This time, with both owlets together and a towel to cover the basket until they settled down, we stood a better chance of success. It was not to be. Gylfie flew out a second time when Jason removed the towel. Again, she landed fine. Without having an alternative solution to protect these babies on the busy golf course, we made one final attempt. It proved futile. In the end, we left Twilight in the basket, and Gylfie in the safest place we could get her to stay put; the richly-landscaped backyard of James and Georgeann. Lee Prouty holds Gylfie as we prepare to put them both back in the nest basket. Photograph by Suzanne Shoemaker. We returned at dusk, hoping to get Gylfie into the lower branches of the trees. Gylfie, however, was not to be found. We learned that the landscape maintenance crew had come through that day, and the disturbance undoubtedly sent Gylfie into a neighboring yard. The fact that we didn’t find her does not mean that she was in danger, however. She was following the normal course of events for a growing owl. She was big enough and a strong enough flyer to face the world with the help of her parents, who were no doubt standing by. She made up her own mind; it was time to leave the nest. Among the greenery in the yards surrounding the golf course, there is plenty of vegetation in which a young owl can hide. With their strong talons and wings to propel them, young owls can even climb the trunks of trees like a cat, and get themselves into the lower branches. Two days later, Twilight left his nest basket and presumably joined Gylfie. James or Georgeann have not seen them since, but we know Gylfie and Twilight have two healthy parents looking out for them. Their parents will keep them in cover, and continue to feed and watch over them. Sometimes you just have to trust Mother Nature. Elfie squints against the wind. Photograph by Suzanne Shoemaker. The onset of “baby season,” and the addition of several new patients, have made for a busy and exciting three weeks at Owl Moon Raptor Center. So much has happened since my last post that I’m going to break up this update into two. This post will focus on new and existing patients. Part two will tell the stories of some baby owls we helped reunite with their families. I am especially excited to share one of the newbies with you. 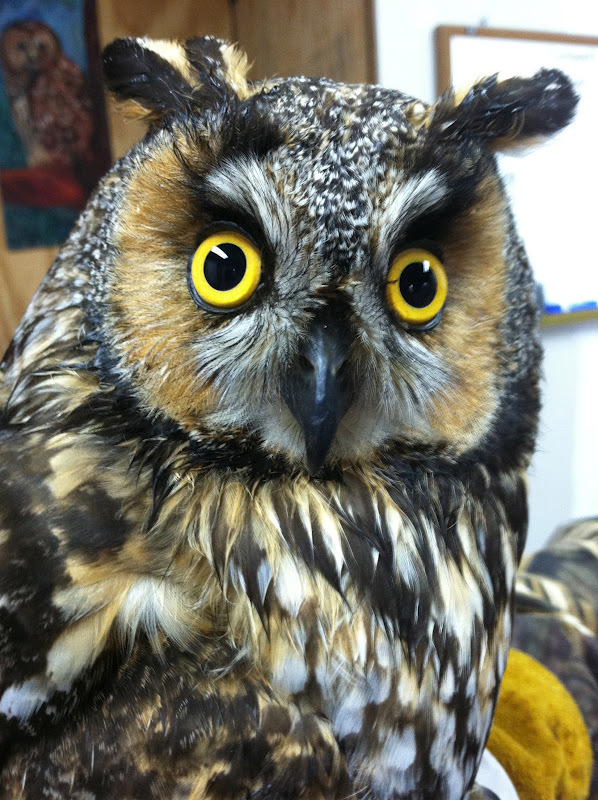 Elfie is a long-eared owl, which is a species I have never encountered before in my career as a wildlife rehabilitator. 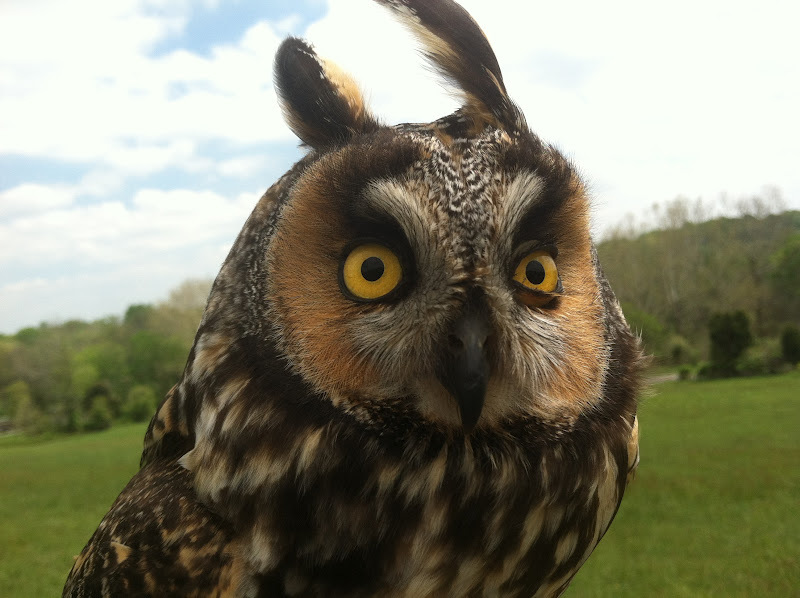 The Long-eared owl is not considered a native of Maryland. Its range extends mostly north and west of us. 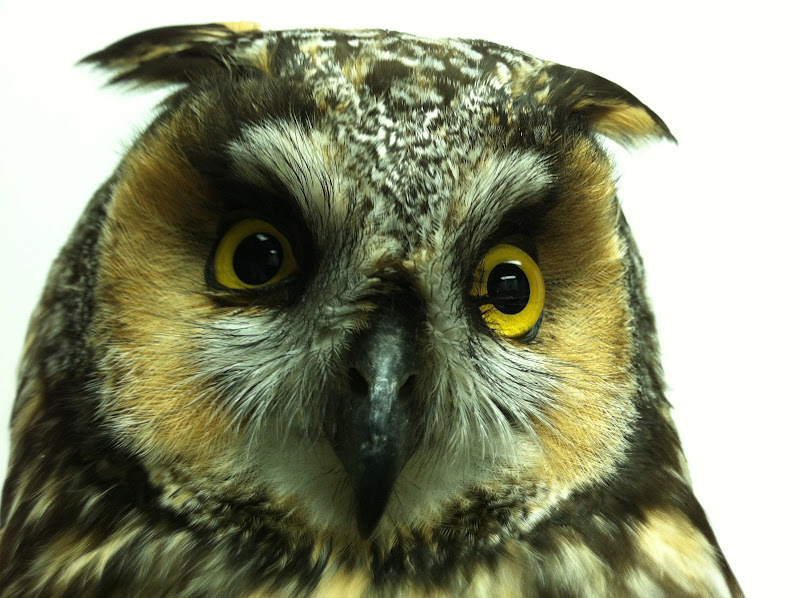 MD Department of Natural Resources rates Long-eared owls in the state’s Rare, Threatened, or Endangered Species List as SH: historically known from Maryland but not verified for an extended period of time usually 20 or more years), with the expectation that it may be rediscovered. Even in their normal range, long-eared owls are not often seen. They are strictly nocturnal, and very secretive. Elfie was found by Diane on the ground just outside her fenced backyard in Gaithersburg, MD on March 22nd. Elfie may well have been just passing through on northward migration when an accident befell her. It was Diane’s dog barking and the ruckus the crows were making that drew her attention to Elfie. 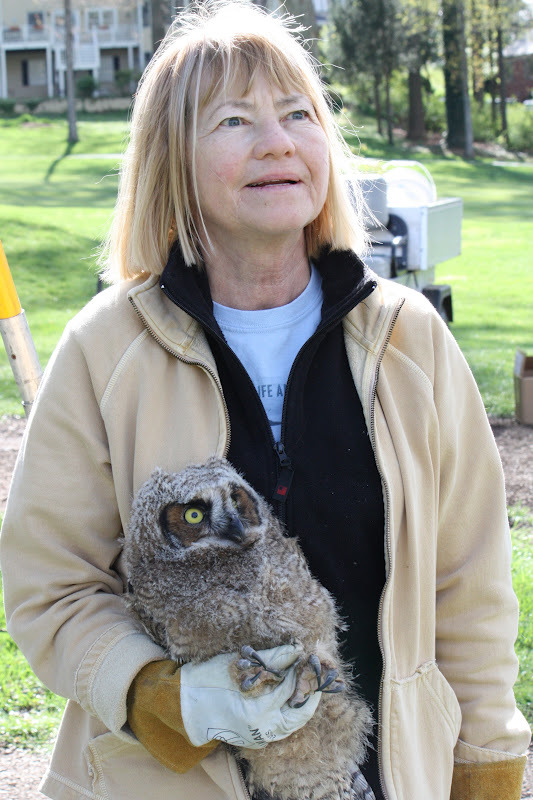 She acted quickly, placing the owl in a box and transporting it to Second Chance Wildlife Center. 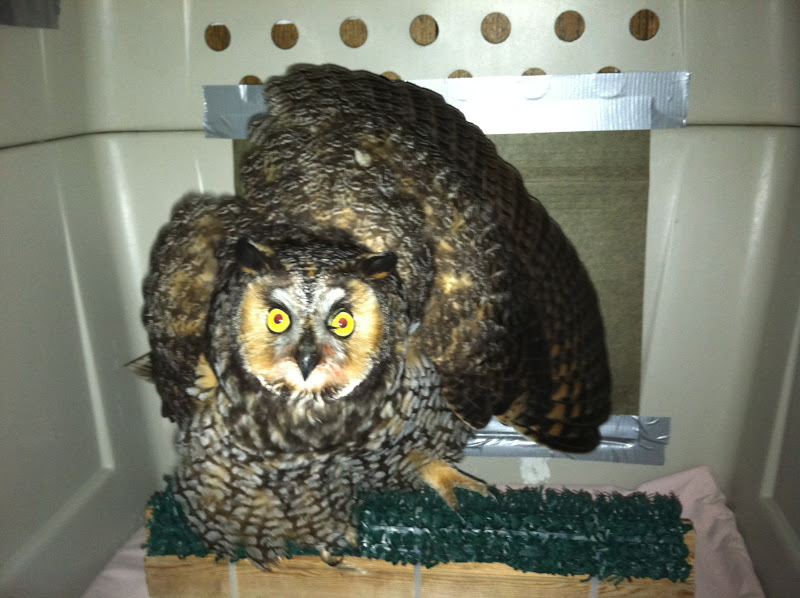 Second Chance examined, took X-rays and treated the owl for three days before transferring her to Owl Moon on March 25th. The X-rays showed nothing remarkable, but it became evident by observation that Elfie had suffered a soft-tissue injury in her right shoulder. The evidence was in her “threat posture.” When a grounded owl feels threatened, their normal response is to try and look bigger and more threatening by raising and turning both wings forward-facing, and clapping their beaks. When Elfie tries to look bigger, only one wing comes up, on her good left side. We placed her on a non-steroidal anti-inflammatory drug (NSAID) to reduce her pain and inflammation, and kept her confined to encourage her to rest her injured shoulder for a full three weeks. This week we began giving her short exercise sessions on a creance line to see how she’s coming along and to help her begin to stretch and return to full health, we hope. It is difficult to say if she will have a complete recovery after only two flying sessions, but I am optimistic. She is not gaining much altitude, but flies a good distance before landing. Her right wing is slightly off, but overall her flight is balanced, and we know she is capable of full range of motion in both wings. Only time will tell, and we will keep you posted. Elfie shows off the long "ears" for which her species is named. They are not actually ears, but rather tufts of feathers on the top of the head. Her real ears are not visible under all her feathers. Photograph by Suzanne Shoemaker. The shape of Elfie's face changes dramatically depending on the posture of her "ears." Photograph by Suzanne Shoemaker. Elfie looks quite different when her "ears" are down. Photograph by Suzanne Shoemaker. Elfie's shoulder injury is revealed in her defensive posture. In a healthy owl both wings would be up like the one on the right, but Elfie's injury prevents her from lifting the other wing. Photograph by Suzanne Shoemaker. Unfortunately, two other new patients did not make it, but I will tell you about them because I feel that all my patients deserve to have their stories told. The same day we received Elfie, Frederick County Animal Control Officer Michael Douglas brought me a beautiful adult male red-shouldered hawk. It was apparent that this bird had been grounded for some time, unable to hunt. He was weak and emaciated, and his right wing was broken. I could feel a callus already forming near the wrist joint. I knew the damage was severe and this bird had suffered a lot already, so I brought him directly to Second Chance for an x-ray. What I didn’t know until I saw the films, was that the damage was caused by a gunshot. The shot had broken bones in two places on the end of the wing, one right at the wrist joint. There was no possible way to repair the damage, and sadly, euthanasia was the only humane option. I reported our findings to Officer Douglas and State and Federal authorities. Officer Douglas is doggedly investigating a solid lead in the case. I wish him success and hope that justice prevails. The other sad case was an adult female barred owl, found by Georgina in a bamboo thicket behind her house in Rockville, MD. Like Diane, it was her dog that first alerted her to the owl. I picked the owl up and brought her back to Owl Moon. She was thin, weak, and dehydrated, but there was no evidence of trauma. She was experiencing respiratory distress, so I treated her with an NSAID and gave her a good dose of fluids to rehydrate her. Sadly she passed away during the night. Respiratory distress can be caused by toxic substances such as lead and rat poisons, which are increasingly common in our environment, and likely to wind up in raptors through the food chain. Because the cause of this owl’s death was a mystery, I asked Dr. Pierce at the MD Department of Health Laboratory in Frederick to perform a necropsy. She kindly agreed, and though she was unable to find any gross lesions, she sent tissues out for histopathology and toxicology testing. I have not yet received a report of the results. Now for some updates to the patients you know. On March 27th two of our red-shouldered hawks, Soldier-girl and Rufus, were transferred to Tri-State Bird Rescue and Research Center. We had done for them as much as we could do at Owl Moon. Both birds needed to be live-prey tested in a large flight cage before we could be sure they could hunt successfully with their respective handicaps: Soldier-girl’s being a weakened grip in the left foot, and Rufus’s being his missing right eye. If these two could prove they could hunt, they would be reconditioned and released. Dr. Erica Miller, an avian specialist, examined Rufus prior to prey testing. What she found was not good. His left, and only remaining eye was visually impaired. It, too, must have been injured by the vehicle impact that ruined his right eye. The news was devastating. We had all grown fond of him. However, it did explain the observations I had noted about his behavior in the mew. He was more likely to fly into things, such as perches and walls, than the other red-shoulders, and he often perched with his blind eye oriented toward me. Of course, being blind in one eye might be enough to explain some crashing, but I have released other birds that were blind or impaired in one eye, who could still navigate around a mew and catch live prey. Tri-State went ahead with live-prey testing, but sadly, Rufus began losing weight after four days with access to live prey. They decided to euthanize, and sadly I agreed. In light of the new information, and with knowledge that his disposition was not suited to life in captivity, I knew there could be no satisfactory life for him. Fortunately, there was good news from Tri-State as well. Soldier-girl, the juvenile red-shouldered hawk I have been nursing along for months following her nasty leg fracture, caught and killed three live mice on her first day out in the flight cage. That’s the way it is supposed to be done! So Soldier-girl is now on the fast track to release, and you can be sure I will be there to witness and photograph the event. I plan to bring her back to Owl Moon for the occasion. Zen appears calm now, but don't be fooled. He is one feisty owl when it comes time for his physical therapy sessions. Photograph by Suzanne Shoemaker. Sonya is much happier now that she is out in the mew. Photograph by Suzanne Shoemaker. Meanwhile at OMRC, Squeak-toy, the juvenile male red-shouldered hawk still shares a mew with Bob, the adult male. Squeak-toy is due to be transferred to Hawk Mountain Sanctuary this month. His new home is ready and his transfer awaits only the final approval of their permit, which was caught up in a backlog of paperwork at the US Fish and Wildlife Permitting Office. Bob is doing well and receiving regular flight exercise to recondition him for release, though his release may be held up until he grows in a few tail feathers. He arrived in rehab short four feathers on the right side, and he has yet to grow them in. He would have difficulty steering with such an asymmetric tail; so we’d like to see some feather replacement before we turn him loose. 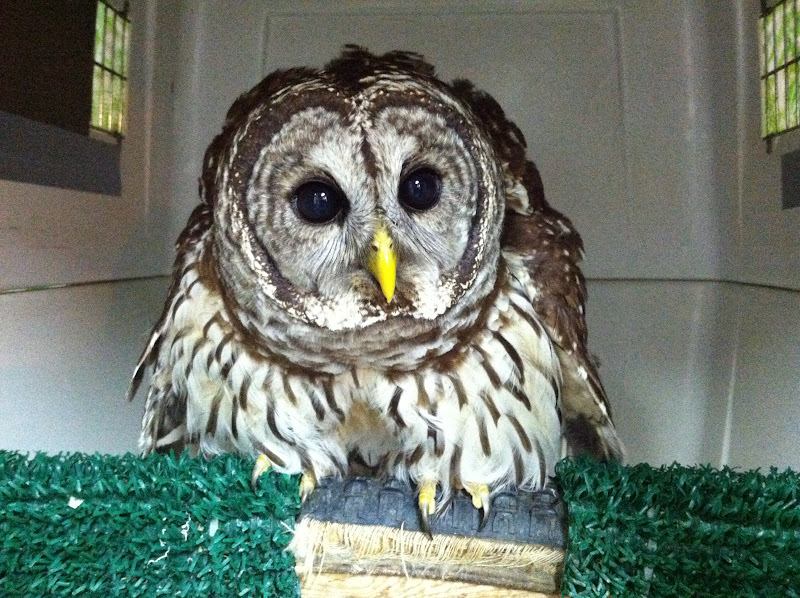 Zen, the barred owl who was hit by a car in Mt. Airy, MD and suffered a fracture of the process of his left elbow, is barely tolerating his daily physical therapy (PT) sessions and every other day creance flying exercise. His name, which seemed so fitting when he arrived, has proved to be somewhat ironic. I have never known a more rascally and determined barred owl! Each time I go to catch him for his PT session; I grit my teeth and prepare for his latest evasive action. Unfortunately, Zen’s elbow therapy is proving to be a losing battle. The callus that formed around the fractured chip has grown large, and impedes the action of the elbow joint, reducing extension of his wing by more than 25 degrees. The result is that he will never fly well enough for release. Fortunately, his bold and mischievous personality makes him a good candidate for education. Unfortunately for Zen, Barred owls are not in short supply. If you would like to help find Zen a home please inquire at your local nature center. 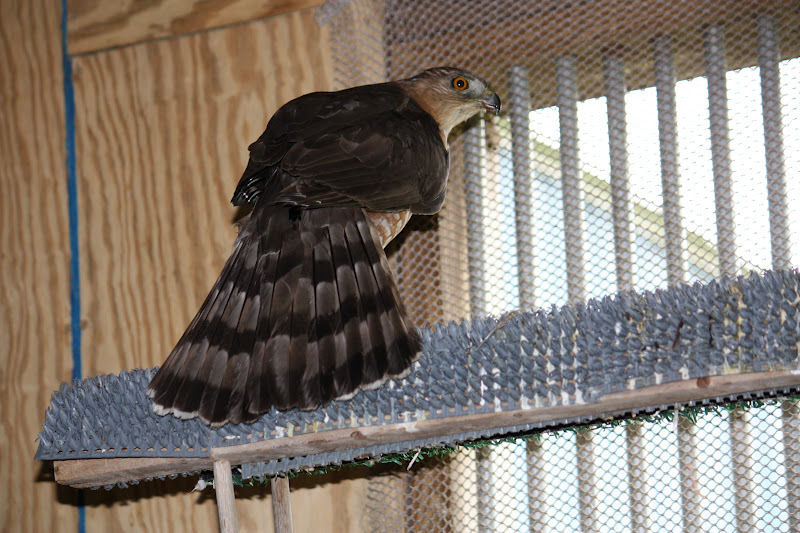 Sonya, the adult Cooper’s Hawk that was hit by a car, resulting in a compound fracture in her left leg (tibiotarsus), is finally outdoors in a mew. She is much happier there. She was so stir crazy that I only kept her confined indoors for five days following her pin removal on March 22nd. Sonya still has a way to go before we can consider her a release candidate. She does not bear full weight on the leg, nor does she grip perches with that foot yet, but she is gradually improving in both areas, and as long as she is improving there is hope. I remember when Soldier-girl was at this stage of recovery and it was difficult to imagine her ever being ready for release. That brings us up to date on the patients. I can’t wait to share with you the pictures and videos of the adorable baby owlets.